Milltown Loch (Loch a Mhuilinn) lies at the heart of the settled area around Applecross Bay and is a particularly good example of a loch influenced by higher levels of nutrients due to the local presence of limestone. It provides a habitat for various insects, butterflies, birds, and various interesting plants including an unusual species of orchid. However, the loch was not being managed, and there were particular problems due to the overgrowth of reeds which were causing it to silt up in some areas. 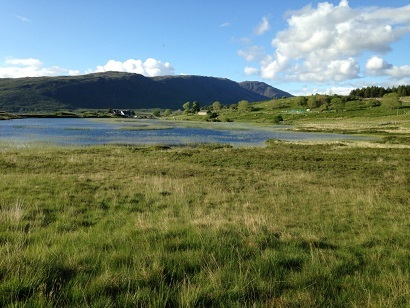 An ecological survey of the loch and the surrounding area was carried out, and a management plan for maintaining and enhancing its ecological value was produced. This management plan was then implemented, dredging the loch, installing fishing stances, and building a bird/wildlife hide. This has encouraged greater use for recreational purposes. A Milltown Loch leaflet was produced which detailed the geology, flora and fauna of the area, and interpretive carved seats were placed within the bird hide, along with a wildlife book and posters detailing the wildlife that can be seen at the loch. The loch lies adjacent to a footpath and has been incorporated into the Archaeological Trail, the old mill ruins and the loch itself both of archaeological interest. The Applecross Angling Association has been integral in this project. The work undertaken at the loch has improved conditions for the wild brown trout which can be found there. The association now manages the fishing stances which are used on a regular basis.